Woomera was, of course, the test range, jointly funded by the UK and Australia. It was run by the WRE (Weapons Research Establishment) based at nearby (relatively!) Salisbury, South Australia. The airfield at RAAF Edinburgh was used for the V bombers during Blue Steel trials and for transport generally. The Range was first established in 1947 under the Anglo-Australia Defence Project and the Woomera Prohibited Area (WPA) was declared for the purposes of ‘testing war materials’. It was sometimes referred to as the ‘Joint Project’. 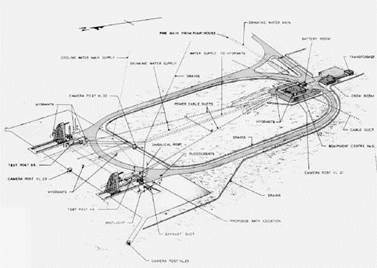 Most of the early work was devoted to surface-to-air missiles, which would result in the Bloodhound, Thunderbird and Sea Slug missiles. A Blue Streak launch site was built at Lake Hart, with the Black Knight launch sites not far away. Later, a Black Knight launch site was adapted for the Black Arrow satellite launcher. Work began on a Blue Streak launch site set into the side on a canyon, with the intention of building a silo (‘underground launcher’) around it, but with the military cancellation this was abandoned. Figure 3. Black Knight launch area at Woomera. There were two gantries, one of which was later adapted for the Black Arrow satellite launcher. Figure 4. The High Down site on the Isle of Wight. launching. 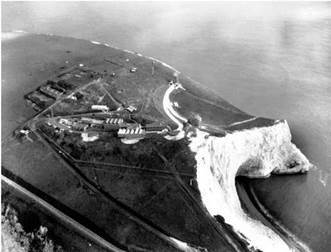 It was situated by the old Needles Battery, on the top of the chalk cliffs overlooking the Needles lighthouse.